To Wash or Not To Wash?? That is the question! Okay..So I have these TOMS..I LOVE my TOMS! SO with much debate…I decided I would wash them and see how they fared in the laundry. Obviously, these are the canvas ones and I would not suggest washing the ones that are made of those cute little sparkles! But, I am happy that I can continue to wear my fresh smelling TOMS! Oh and I just threw them in the washer with some TIDE and then let them air dry! 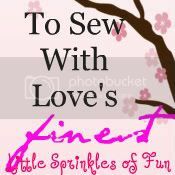 To Sew With Love is having their vote for the To Sew With Love’s Finest of 2011! I was voted July’s Finest in 2011. So I am a finalist in the year end vote! I would LOVE it if you would go and vote for my project to win 2011’s Finest! My project is the July—4th of July outfit (flip flops). They are also giving away lots of other prizes to those that vote! So head on over there and check it out! I am a December finalist at to Sew With Love! I would LOVE it if you could head on over there and vote for my Christmas Outfit! Voting is open until January 6th!